Please note: a minimum annual personal income of $80,000 or household income of $150,000 or a minimum spend of $25,000 per year is required for this premium card. 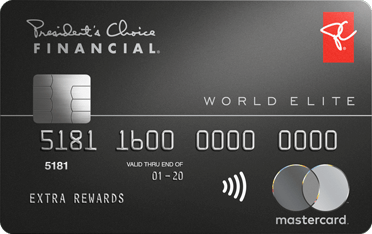 If you do not meet the minimum income requirements for the President's Choice Financial World Elite Mastercard®, your application will be considered for the President's Choice Financial World Mastercard® or standard President's Choice Financial Mastercard®. 1PC Optimum points will be awarded within 4-6 weeks of purchase. Minimum redemption is 10,000 points (worth $10 in rewards) at participating stores. Some redemption restrictions apply; visit pcoptimum.ca for details and full store list. 2Visit pcoptimum.ca for details on participating stores where the PC Optimum program is offered. 3Earn 3 cents per purchased litre of Esso Supreme (Octane 91) and Esso SUPREME+ (Octane 93) gasoline only. Earn 2 cents per purchased litre on other gasoline or diesel. Cents per litre is payable in PC Optimum points when you use your President's Choice Financial World Elite Mastercard at Esso stations in Canada. 2 cents per litre amounts to 20 PC Optimum points. 3 cents per litre amounts to 30 PC Optimum points. 4Earn 2 cents per purchased litre of gasoline or diesel, payable in PC Optimum points when you use your President's Choice Financial Mastercard® or President's Choice Financial World Mastercard® at Esso stations in Canada. 2 cents per litre amounts to 20 PC Optimum points. 5Get a bonus 10 PC Optimum points per dollar of your PC travel services purchase (taxes included) charged to your President's Choice Financial Mastercard® or President's Choice Financial World Mastercard® and 20 bonus PC Optimum points per dollar charged to your President's Choice Financial World Elite Mastercard, in addition to the regular 10 PC Optimum points per dollar earned for all purchases on these cards. Bonus PC Optimum points will be shown as "PC Travel Bonus Rewards" on your PC Optimum points statement. Account must be in good standing. Offer subject to change. PC travel services are provided by 8742995 Canada Inc. doing business as Travel Nation Canada. President's Choice Bank and its related companies are not affiliated with Travel Nation Canada and are not responsible for delivery of the services or liable in connection therewith. 6All PC Optimum members earn 15 points per dollar of eligible purchases at Shoppers Drug Mart. When you use a President's Choice Financial Mastercard® you will also earn PC Optimum points for all Shoppers Drug Mart purchases charged to the credit card as follows: with the standard PC Financial Mastercard®, 10 points per dollar; with the PC Financial World Mastercard®, 20 points per dollar; with the PC Financial World Elite Mastercard®, 30 points per dollar. 7Balance Transfers for new accounts: You must apply by December 31, 2019 in order to be eligible for the current promotional balance transfer offer of a 0.97% interest rate for 6 months. Offer is available to eligible new customers only, within 90 days of your President's Choice Financial® Mastercard® account ("Account") approval. This offer may be changed, extended or cancelled without notice. Promotional interest rate is annual and applies, unless your Account is in default, only to the transferred amount for 6 months after the transaction date, after which the cash advance interest rate applicable to your Account applies to any remaining balance until the balance is paid in full, unless your Account is in default. Balance transfers are treated like cash advances and interest is charged from the date the transfer occurs, which may be up to 30 business days from your activation of the Account. Continue making your minimum payments on accounts from which you are transferring until the balance transfer amounts are credited to those accounts in order to avoid late charges and penalties. If the total amount to be transferred is more than your available credit limit, President's Choice® Bank ("PC® Bank") may send your creditors either full or partial payment up to the amount of your available credit limit. PC® Bank reserves the right to limit the number and amount of balance transfers and to decline them for any reason. Balances from other President's Choice Financial® accounts are not eligible to be transferred. Stop payments are not allowed.PC Optimum points are not earned on balance transfers unless otherwise specified. Please refer to your Cardholder Agreement and Card Carrier disclosures for further information. ®/MD Shoppers Drug Mart is a registered trademark of 911979 Alberta Ltd., used under license. ‡President's Choice Financial Mastercard® is provided by President's Choice Bank. If you do your grocery shopping where President's Choice products are sold and frequent Shoppers Drug Mart or PharmaprixMD, you'll want to pay close attention to the PC Financial® World Elite Mastercard®. This no-fee card allows you to earn PC Optimum points which can then be put towards any purchases made at participating stores such as Loblaws, Real Canadian Superstore, Joe Fresh, Shoppers Drug Mart and more. Earning rewards towards food, cosmetics, and other types of merchandise has never been so easy. You're basically getting 3% in cash-equivalent points at grocery stores where President's Choice products are sold and 4.5% at Shoppers Drug Mart and PharmaprixMD. If you're partisan to Esso gas, you also earn at least 30 points per litre at Esso locations. Not to mention the 10 points per $1 spent on all other purchases, making the PC Financial® World Elite Mastercard® a considerable option for everyday purchases. And with the President's Choice Financial® World Elite Mastercard®, you can earn additional points on special offers exclusive to PC Optimum cardholders. That amounts to a lot of free groceries over two years (or duds from Joe Fresh, which is our personal guilty pleasure when popping into Loblaws for milk). Cardholders get exclusive in-store promos and can earn even more points if they have a PC Optimum points card. Out of the three cards offered by PC Financial®, this card has the highest earning rate. 45 PC Optimum points6 for every $1 spent at Shoppers Drug Mart®* and PharmaprixMD. 30 PC Optimum points for every $1 spent, at other Loblaws-affiliated retailers2 and travel services at pctravel.ca5. At least 30 PC Optimum points per litre pumped at Esso gas stations3. 10 PC Optimum points for every $1 spent, everywhere else. Limited time offer: new cardholders get a 0.97% balance transfer interest rate for the first six months. In order to get this rate, applicants must be new PC Financial customers and are required to make the transfers within 90 days of opening the account. After six months, the balance transfer rate goes up to 22.97%, and each transfer will be subject to a fee equal to 1% of the amount transferred. You get purchase protection and extended warranty features with the card. Up to four free additional cards on your account for family members, so you can earn PC Optimum points even faster. You're limited to only earning PC Optimum points with card, so if you want more flexible rewards, try one of the best cash-back credit cards in Canada instead! Minimum redemption is 10,000 PC Optimum points (worth $10 in free rewards) and in increments of 10,000 points thereafter at participating stores. While this card comes with the highest earning rate out of the three credit cards offered by PC Financial®, it also has the highest eligibility requirements ($80,000 minimum personal annual income or $150,000 minimum household annual income).